Exciting and unusual, the Orange Monarch Snow Crocus is a stunning addition to your early spring landscape. This bright orange cup shaped flower is one of the first to welcome the arrival of spring. These eye catching orange flowers make a dramatic appearance against the drab colours of winter. Snow crocus bulbs (Crocus olivieri balansae) are easy to grow and thrive in well drained clay, loamy, or sandy soil and in full or partial sun. 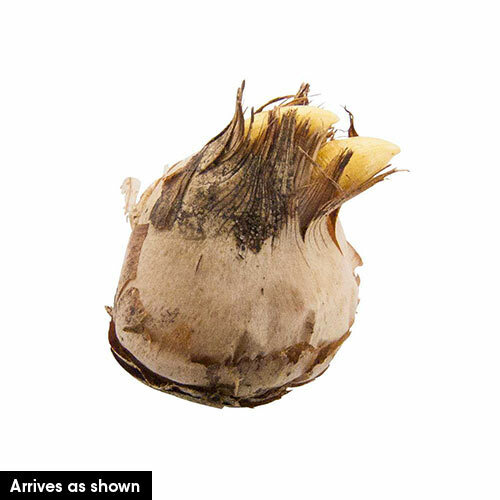 Plant the bulbs in the fall at a depth of 3 inches and about 3 to 4 inches apart. 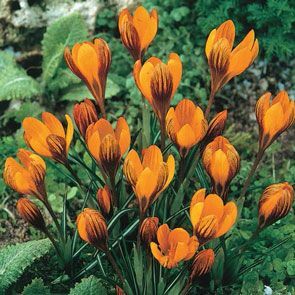 The Orange Monarch snow crocus grows in zones 3 - 9 to a height of about 4 to 6 inches. This perennial flower naturalizes easily for a dramatic show year after year with little or no maintenance. The Orange Monarch snow crocus is a standout whether planted alone or with other colours of snow crocus bulbs. A good choice for naturalizing, these will fill in bare patches in the landscape or liven up a wooded area. An unusual but effective use of the crocus is to plant them directly into the lawn for early spring colour. The snow crocus is also a popular bulb to grow indoors. Smile when you see these bright orange beauties welcoming spring after a long winter. Distinctive orange colour is rare for a crocus.